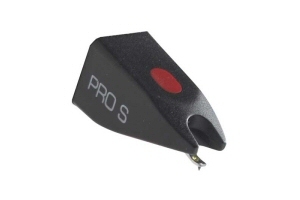 Replacement stylus to be used in Ortofon Pro S OM and Concorde cartridges. The Ortofon Pro S cartridge retains the overall sonic properties of the standard Pro model, but provides a wider stylus for low wear as well as durability under demanding conditions. No matter what application, the Ortofon Pro S cartridge provides remarkable versatility for virtually any setting.